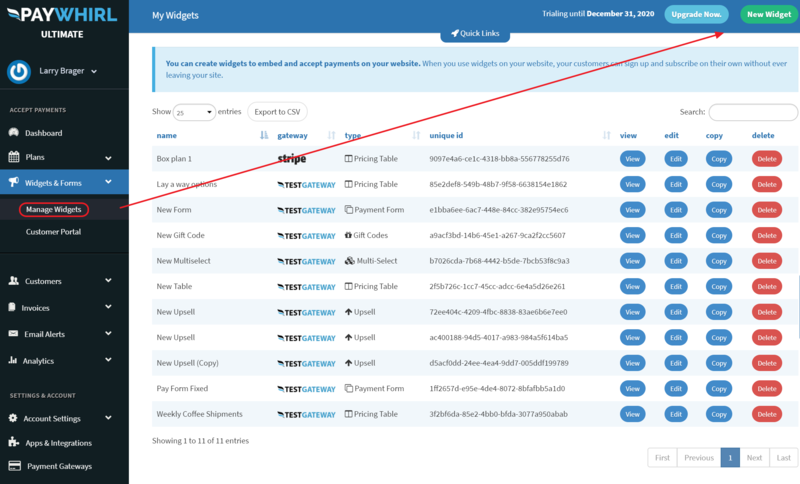 The upsell widget can be chained to other widgets to create a checkout funnel on PayWhirl. Upsell payments can be recurring and/or one time. The "upsell" payment widget allows you to offer customers additional products or services during checkout. 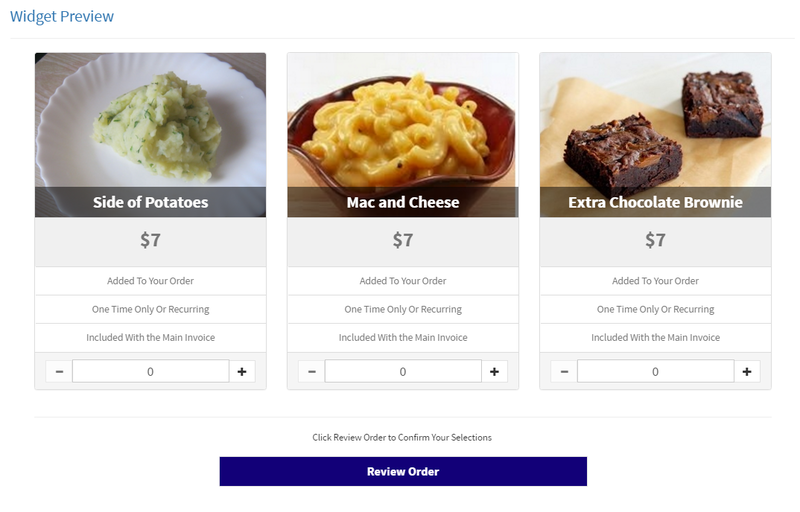 By chaining upsell widgets together you can create a checkout funnel for customers and allow them to create customized subscriptions along the way. Once you have everything setup, customers will start off viewing your "main widget" (ie. a pricing table widget embedded in your website) and then will be forwarded to your upsell widget(s) before they finish checkout. To create an upsell widget, navigate to Widgets and Forms > Manage Widgets > New Widget (green button in top right corner) and select "Upsell Widget" from the list of available widgets. The main settings of the widget determine the look and feel for the customer. Start off by giving your upsell widget a name. You can set the number of columns, change the text, and adjust the colors to match your theme. Note: If you there isn't enough room to display the number of columns you select, the items may stack vertically. This happens often when viewing on mobile devices. If this happens, you can override widget layouts using css. Next, you can add any products and/or services that will be offered to customers in your upsell widget. You will need to include the name, price and sku (optional) for each product or service. 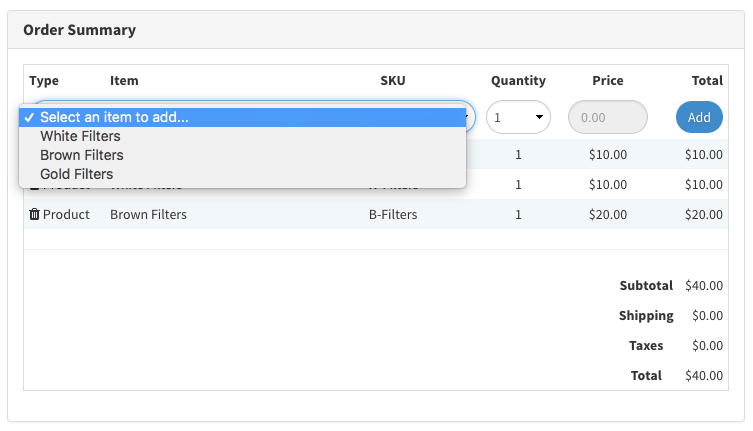 To make sure your upsells are displayed and available for customers to select in the customer portal, switch the "Enabled" setting to "Yes" for each product / service you add. Recurring - Will get attached to the last subscription plan added to the cart and will bill on the same frequency but as a separate line item on the invoice. Recurring upsells will be subject to tax and shipping settings from the payment plan. One-time product - This type of upsell is added to the cart as a one time sale. Taxes and shipping will be charged according to the rules configured. It will be billed at the time of checkout regardless of the plan in the cart. One-time fee - This type is added to the cart as a one-time sale. No taxes or fees will be charged on fees. It will be billed at the time of checkout regardless of the plan in the cart. Note: If you want an upsell to attach to a customer's subscription plan (selected in a previous widget), make sure customers are only able to select ONE PLAN IN YOUR FIRST WIDGET where they select their "main" subscription plan. Otherwise the system will attach the upsell to the LAST subscription that was added to the cart prior to the upsell. For this reason, we recommend using a pricing table or payment form for your FIRST widget in the chain so customers can only select one "main subscription" plan. Although the upsell widget has it's own embed code, its designed to be used in a chain and normally does NOT get embedded into a page on your website. Instead, you will forward customers to this widget using the "Forward to Widget" setting under the advanced settings section in your previous widget. Change the "Forward to Widget" setting from "Shopping Cart" to the upsell widget you created to make the connection. 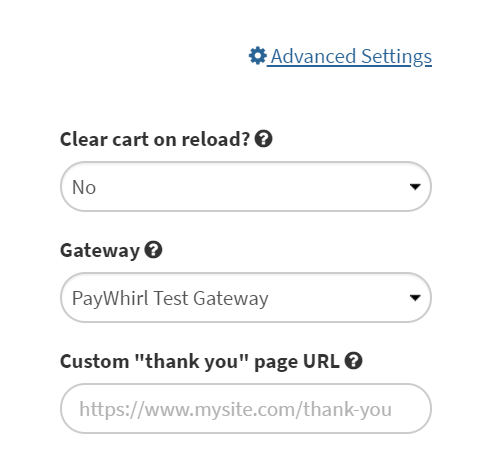 Note: By default, all widgets are set to YES for "clear cart on reload" and you will want to make sure to change this is set to "No" for all your upsell widgets. This will prevent previously selected items, from prior widgets in the funnel, from being removed from the cart when the upsell widget(s) load. Finally, if enabled in your advanced account settings, customers can modify their custom subscriptions from the customer portal by viewing their latest, unpaid invoice. Any recurring upsell(s) that are enabled will appear as options for customers to add / remove to their subscription. Any changes made by the customer will carry forward onto future invoices and orders, once processed, so you'll be able to fulfill the correct item(s).